Montezuma Condos in Keystone CO Real Estate is one of many condo complexes in the Keystone Lake Village area of Keystone Colorado. Built in 1977, Montezuma Condo is comprised of 24 total units: 8 – studios, 8 one bedrooms, 7 two bedrooms, and 1- three bedroom. These Keystone condos feature impressive mountain, lake and down valley views and have quick access across the lower parking lot to the indoor heated pool and hot tub in the East Lake Building. Montezuma Condos are located only steps from the Snake River, Summit County recreation bike path, as well as the activities, shops and restaurants in the Lakeside Village and the Keystone Lodge & Spa. The common areas within Montezuma Condos received upgraded finishes and new ski lockers in 2008. Ample surface parking is available for owners and guests, and there are also separately deeded one car garages in the building which occasionally come up for sale for purchase with or without one of these Keystone ski condos. Montezuma Condo (HOA) homeowner association dues dues, although higher than other complexes in Keystone, are inclusive of all utilities, even firewood. 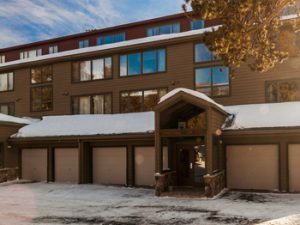 Montezuma Condos are a great choice for those Buyers looking to purchase a Keystone Colorado condo that is near the Lakeside Village but on the bus route – only a short ride to River Run Village and all that Keystone and Summit County Real Estate has to offer.